Written by: Victoria Irwin on January 25, 2014. 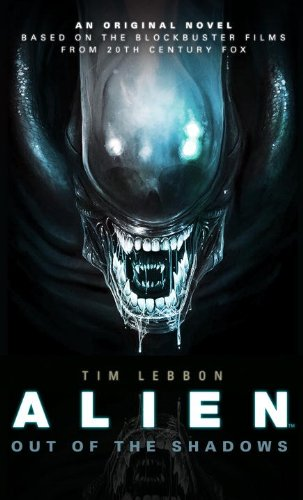 Alien: Out of the Shadows, by New York Times-Best Selling author Tim Lebbon, is a worthy story based on the blockbuster Alien film franchise. Taking place in the space between Alien and Aliens, Alien: Out of the Shadows tells the story of the crew of the Marion, a mining ship suddenly attacked by mysterious creatures from the planet they were harvesting ore from. After nearly four months alone with no response to cries for rescue, Ellen Ripley’s small rescue pod docks with the Marion. Out of one disaster and into another, Ripley finds herself refacing her nightmare after being in stasis for decades. Engineer Chris Hooper and his fellow crew mates meet Ripley with distrust, and in the case of Hooper, attraction. With Ripley’s working knowledge of how the aliens work, the crew descend onto the planet below the damaged ship in an attempt to gather supplies to escape. On the planet they meet more horrors than imagined, but nothing compared to what waits for them back on the Marion. Rarely, do I find myself tearing through a book with the speed that I found myself reading Alien: Out of the Shadows. Tim Lebbon captures Ripley’s PTSD from her time on the Nostromo to perfection. As Ripley hallucinates about her daughter and the horrors that will await her should she not stop the Aliens from reaching earth, one cannot help but feel her panic and concern. Alien was one of the first VHS tapes my father ever purchased, and I can still remember my terror at seeing the “face huggers” for the first time; not to mention the infamous scene of an alien tearing out of a human chest. The book contains quite a few moments of intense gore. I certainly don’t recommend it for young children. One particular scene features a character being torn in half, and it is described in detail. With high drama and non-stop suspense, Alien: Out of the Shadows is a quick read and a must have for fans of the Alien franchise. The book is available January 28, 2014 from Titan Books.